• Grate potatoes coarsely or finely, according to your preference. Finely grate the onion. • Place grated potatoes and onion in a clean kitchen towel and squeeze tightly until all of the liquid is strained. • Place the strained potatoes and onion in a large bowl and add the eggs, breadcrumbs, salt and pepper. • Heat the 1-inch of oil in a large pan and drop 6 to 8 spoonfuls of mixture into hot oil. 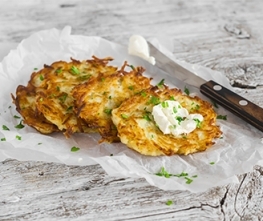 Using the back of a spoon, pat down each latke to flatten it. Put as many as you can in the skillet without crowding. Putting them too close together will make them soggy. • Fry 3 to 4 minutes on each side, until golden and crisp around the edges; repeat procedure until finished with all the batter. • Blot excess oil with paper towels and serve warm with desired topping. * Serve with Kelchner's Creamy Horseradish Sauce or mix Kelchner's Horseradish with sour cream and chives.